I still remember the moment during my first Halo run through when I totally knew the game was amazing - it was during The Silent Cartographer level and it was time to leave the place. In a mad panic, I had to guide the Master Chief back up the surface of the Halo, whilst a relentless section of music was playing - 'Rock Anthem For Saving The World' featuring legendary guitarist Steve Vai. Yeah, the choir doing their funky monks 'oooh ooah aaahs' is pretty cool but that moment is stuck with me forever. 10 years since Halo's original release, it's the stuff of legend that the Halo game had one of the best soundtracks that ever accompanied a shooter and this was a key element of the success of the game. Subsequent Halo games have followed in the tradition of great music - have they all met the standard set by the game that changed the way video games are made? I thought I'd take the time to kick back and reflect on the music of Halo, have a chat about how music can influence a scene ....it's almost a love letter to composer Marty O'Donnell and less his well known counterpart, Michael Salvatori. This is the soundtrack to the game that changed gaming forever. Marty had already done a couple of gigs for Bungie in the form of the Myth series and as Microsoft had brought the Bungie studio to get their hands on the Halo IP, expectations were high. Marty duly delivered one of the most brilliant soundtracks ever. The monks' chorus, and the main theme riff with those wondrous string instruments are perhaps as recognizable to a gamer as the first notes to Star Wars are to a movie fan. I already mentioned 'Rock Anthem For Saving The World' right? While many people might know that Steve Vai played on a couple of Halo soundtracks, I wonder how many know that Flea from the Red Hot Chili Peppers had a go with his trumpet! The success of Halo: Combat Evolved meant that Microsoft's Xbox platform was a winner but it needed to consolidate its place in the gaming market. Enter Halo 2. Bungie and Microsoft threw the kitchen sink into making Halo 2 and a lot of the cash went into the music and its promotion. If Halo soundtrack was a ride through a sandy beach on a Warthog, Halo 2 was taking on a gaggle of Brutes armed with a paper clip. If there's one moment in Halo 2 that is a piece of amazing original music, it's the section where you play as the Arbiter running through a gauntlet of giant Sentinels as Steve Vai again shreds the Halo theme song so hard and fast he must have burned his figures doing the take. Check out Vai doing the theme live here with an orchestra (it's a slow burn but worth it). 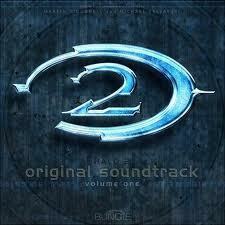 Halo 2's soundtrack was so big, they actually released two versions of it. The first, we'll call the 'rock' version, the second was the more traditional suite of songs. Apparently, the first version was the biggest selling video game soundtrack of all time. If you wanted to find one piece that sums up the Halo 2 soundtrack, there's a key scene shortly after the Prophets replace the Elites with the Brutes and a mini civil war of sorts takes place. It's a big, monstrous piece of music that was' inspired' by Breaking Benjamin. It sounds a little bit like this. Only the strongest survive. Looking back at Halo 2's music in the context of the 5 games, it was as awesome as it was bloated. I'll get right to it. 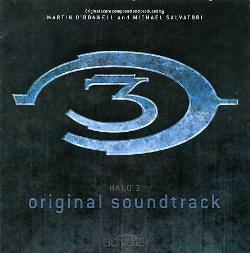 I consider Halo 3 to be Marty O'Donnell's masterpiece. We knew the music of Halo 3 was going to be epic the moment the Halo 3 announcement trailer was released. Featuring possibly the best piece in the entire history of Halo, the trailer showed Halo 3 was a technical marvel backed by the suggestion of an epic story conclusion and of course, another round of Marty magic. That simple, few note piano introduction morphed into a wall of sound was a great composition and it was, so to speak, game on. The song's name? Finish the Fight. I love the Crow's Nest level music. When the Master Chief finally get's there after taking down a Chieftain, the music matches the miltary operations that are going on. As the Chief walks through the complex to find Miranda Keyes, an injured soldier spies him with disbelief as all Spartans were though dead. A quick re-cap and tour are given, while a subtle military beat begins. This is 'Honorable Intentions'. As the level begins proper, the theme kicks in. It's a great moment and only works because the music is perfectly matched to intent of scene. There's noble work to be done and this is the start. Trumpets herald the begin of the Chief's march to stop that nasty Prophet.... he's the Last of the Brave. Another of the high points of the game's music comes at one of Halo's 'lowest' points, the death of Avery Johnson. When Sergeant Johnson is dying, and asks the Chief to send him out with a bang, that's soundtrack music at it's finest. The music perfectly echoing the sadness of what's occurring. Listen to it here as part of the cut scene. I gave up on Halo Wars after about an hour of playing so I have no idea as to the quality of the music. Fail. An internet search shows that the Spirit of Fire, produced by one Stephen Rippy sounds suitably epic. Detective music in a Halo game? That's what happens when the Rookie of ODST wandered the streets of Mombassa, searching for clues to what had happened to his fellow ODST soldiers. Jazzy saxophones play to evoke a mood that has been used countless times in detective film soundtracks (part of the film noire genre). Sure, it's a cliche in film but I think it was the first for a major gaming release. The music desperately tries to evoke a sense of looking for something, it offers a warm un-easiness but no classic Halo monks or Halo sounding da da da dahs. It broods. Whilst it it is good music, when applied to what is essentially as science fiction shooter, it didn't really click for me. 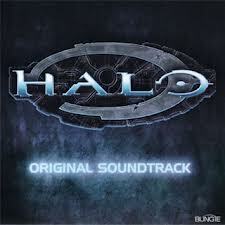 That said, it's 'freshness', when compared to the prior Halo soundtracks, was applauded by many Halo fans. The last hurrah for Halo and Bungie and thus O'Donnell's last chance to cast his magic conductor's wand over a Halo campaign. 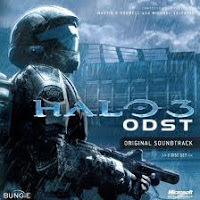 Taking the music in a slightly different direction, O'Donnell was quoted as saying "This is a more character-driven piece, and its also about a planet that everyone knows will fall, and falls to the Covenant." So it's a more somber, more visceral introduction to the game then we're making." And so what did he do? He introduced a mystical element to the main thread of music. Think of a Cobra snake dancing to Egyptian music that smacks of the exotic and primal. 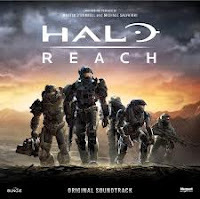 When you get used to the fact the Reach soundtrack is an unfamiliar cousin to Halo 3, you can I enjoy it more. I found on my second campaign run through, where I wasn't so focussed on the plot and getting to the end, I could really listen and get the vibe of the music. As I did for Halo 3, I found the most enjoyable music to be that at the end. Having battled to save Reach and it's people, having seen most of Noble team killed, and then finally Noble 6 bravely succumbing to a blade of an Elite, it's the final two songs Ghosts and Glass, and We Remember that say, this is the end, this happen, it sux but you did great Noble 6, we can rebuild on Reach, all thanks to you. With Halo 4 having a new home at 343 Industries, it's time for a new composer to take over the musical reins for the Halo series. British record producer (Massive Attack) and film score composer; Neil Davidge has been handed the baton. He's signalled he's taken the job seriously by the fact the Halo 4 soundtrack was recorded with 60 players at Abbey Road Studios which you might know as the studio where the Beatles and many other musicians since have recorded (amusingly Bungie are teaming up with Paul McCartney for their next project). The music of Halo has been an awesome contribution to the gaming and the musical arts thus far. Where it heads is up to 343, let's hope they can retain the magic and wonder of Martin O'Donnell's work to ensure a satisfying Halo 4 campaign. I think what we've heard of Halo 4 so far is pretty awesome!! Awesome post! I've only read the words so far but I'll be back to check every one of those links soon! Thanks Woaf! There's some real musical gems in there. I also am really keen to see what Marty does with a certain Beatle!